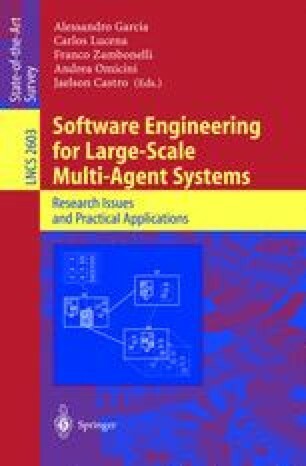 Software architectures of large multi-agent systems (MASs) are inherently complex and have to cope with an increasing number of system-wide properties and their corresponding control policies. With the openness and increasing size and complexity of these systems a more sophisticated software architectural approach becomes necessary. In this context, we propose the Reflective Blackboard architectural pattern, which is the result of the composition of two other well-known architectural patterns: the Blackboard pattern and the Reflection pattern. The proposed pattern provides, early in the architectural design stage, the context in which more detailed decisions related to systemic properties and associated policies can be made in late stages of MAS development. The pattern allows for a better separation of concerns, supporting the separate handling of control strategies by means of the computational reflection technique. Moreover these control activities are handled independently from the application data and agents, providing a better architecture for real-life multi-agent systems. An electronic marketplace architecture, with the goal of interconnecting providers and consumers of goods and services to find one another and transact business electronically, is assumed as a case study through the paper to clarify all the expressed concepts and to show the applicability of our proposal.